President Donald Trump is struggling to convince Congress to fund his border wall along the frontier with Mexico. Meanwhile, Israel is building a new wall along its border with Gaza — underwater. 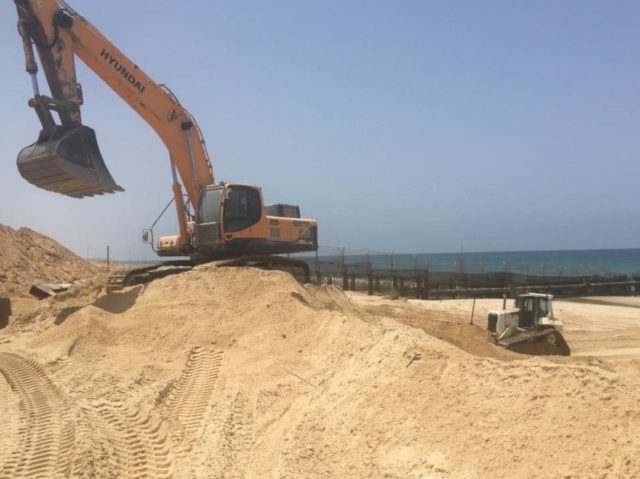 The Defense Ministry has started construction on an underwater barrier, which will stretch from the southern Israeli community of Zikim out into the Mediterranean to stave off Hamas infiltration by sea. The barrier is made up of three layers, including one below sea level, a layer of armored stone and a third layer with barbed wire. In addition, a fence will surround the breakwater to provide a final measure of security. The length and depth of the barrier have not been revealed. “This is the only barrier of its kind in the world, which will effectively block the possibility of infiltrating into Israel via the sea… This will further thwart Hamas’s loss of strategic capabilities,” said Defense Minister Avigdor Liberman. The decision to build an upgraded naval barrier was decided upon after five Hamas frogmen tried to infiltrate Kibbutz Zikim during Operation Protective Edge in 2014. Armed with automatic weapons, fragmentation grenades and several types of explosive devices, they were engaged and killed by the IDF in a combined attack from the sea, ground and air. Since then, Israel has been preparing for possible attacks by sea by Hamas, especially as the IDF has improved its ability to detect and destroy Hamas tunnels under the fence separating the Gaza Strip from Israel. There is a fence extending several hundred yards out to sea along the U.S-Mexico border, but nothing comparable to what Israel is building. Mexican smugglers — both of drugs and people — frequently take to sea to attempt to evade U.S. border security.